Cardinals second base prospect Andy Young reached base three times, drove in two and scored twice in Surprise’s lopsided Tuesday win at Glendale. Results from the game played Tuesday, November 6th. 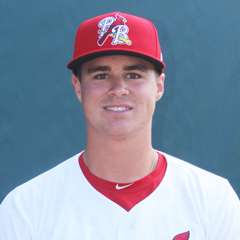 St. Louis Cardinals second base prospect Andy Young accounted for four tallies as the visiting Surprise Saguaros pummeled the Glendale Desert Dogs, 10-1. The Tuesday victory moves Surprise (9-14) into a second-place tie with Glendale in the East Division. Both squads trail Peoria by six games and have an elimination number of two. The visitors banged out 14 hits with Young one of four Saguaros generating a multi-hit effort. St. Louis’ sole representative in the game acted as the designated hitter while batting fifth. Young flied out to right for the second inning’s second out but came through in his team’s six-run explosion two frames later. The 24-year-old came to the plate with runners at the corners with none out and slashed his fourth double of the AFL season. The sharp grounder to left cleared the bases, scoring Bryan Reynolds (PIT) (single) and Cavan Biggio (TOR) (double) to give Surprise a 2-0 lead. Two walks sandwiched around a fly out to right advanced Young to third, putting him in position to score on Santiago Espinal’s (TOR) sac fly to center and driving Glendale’s starting pitcher from the game. With Surprise leading 6-0 after four, Young ignited a three-run fifth with a lead-off single to left. Pittsburgh shortstop Cole Tucker’s single up the middle moved the North Dakota native to second and triggered another pitching change by the Desert Dogs. Catcher Renae Martinez (ARI) greeted the new hurler with a three-run bomb to left center, his first long ball of the Fall campaign. Young finished his day by reaching base once more in his final two plate appearances. He grounded into 5-4-3 double play to bring the top of the sixth to a close but worked the second of three consecutive walks to kick off the ninth. Surprise’s final tally scored on a 4-6-3 double play that moved Young to third, where he was stranded. Meanwhile on the mound, six Saguaros pitchers combined to hold their opponent to a single score on six hits. Starter Scott Blewett (W, 4-0) (KC) tossed the first four innings, permitting a run on four hits. The remaining five hurlers pitched one frame each.